VDay offer for Jamaican expats, for longer international calls to Jamaica. The most challenging part about being an expat is dealing with homesickness, especially on special occasions, such as Valentine’s Day. Everything around is heart-shaped, people are walking down the streets hand in hand, reminding expats that their significant other are sometimes living miles away. 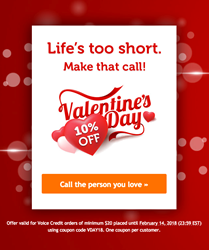 To help Jamaican expats deal with homesickness, this Valentine’s Day TelephoneJamaica.com launches a special offer: 10% OFF Voice Credit orders above $20. The offer is valid for call placed starting February 12 until February 14.
any smartphone, as TelephoneJamaica.com offers a free app, for both iOS and Android devices, called KeepCalling. Besides Voice Credit for international calls, TelephoneJamaica.com also offers Mobile Recharge, a service that helps customers recharge phones anywhere in the world. And a mobile top up can be a great Homesickness Day gift this week. The process is fast and secure and the credit reaches its destination instantly. The operators available for top ups to Jamaica are Digicel and Flow. Customers are happy both with the quality and with the prices offered by TelephoneJamaica.com. On Trustpilot, a famous review site, TelephoneJamaica.com receives constant feedback from its customers and currently has an 8.7 rating. TelephoneJamaica.com is a website for Jamaicans worldwide, powered by KeepCalling, a global telecommunications company registered in 2002 in USA. Presently, KeepCalling provides its services to hundreds of thousands of consumers, with a focus on customer satisfaction. KeepCalling was listed by Inc 5000 as one of the fastest growing companies in the USA for 5 consecutive years.